April 7, 2017 April 12, 2019 - The 'Noms. 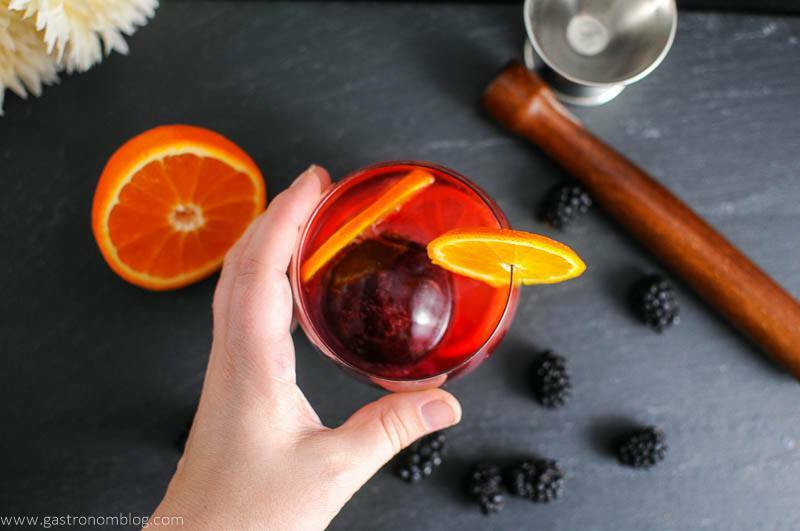 A blackberry and tangerine ice ball makes this fabulous vodka tonic special! 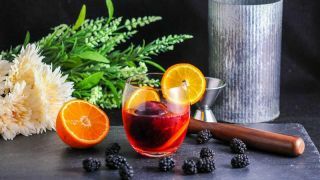 As the weather has started to get warmer, our tastes in cocktails have trended towards lighter spirits like gin and vodka. We also love the spring berries that have come into season. They are perfect for lending some wonderful color and flavor to cocktails. With a warm weekend coming up, we wanted a cocktail that would be perfect for sipping on the patio. We also had friends over while watching our kids roam around our backyard! 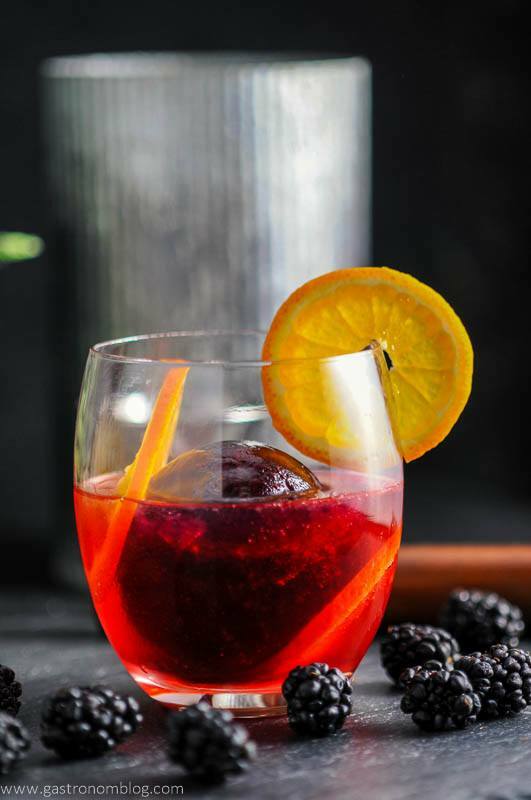 Our next cocktail, the Blackberry and Tangerine Vodka Tonic, is a perfect drink for enjoying a lazy weekend! The classic vodka and tonic is really one of the most simple cocktails you can make, really just vodka and a splash of tonic water over ice. Some folks add a squeeze of either lemon or lime to add a bit of tartness and a splash of color in an other wise plain looking cocktail. A clean simple cocktail, the vodka tonic is a refreshing blend of complex tonic and bright citrus and is perfect for sipping on a warm day. What Classic Cocktail To Base This On? Of course as cocktail bloggers, we look at a simple cocktail like this as a great foundation. We can then build off of it to make something new. By adding a little fresh fruit, a syrup or even bitters, you can take a simple cocktail and change its characteristics completely! We recently used this idea on the vodka tonic’s more complex cousin the gin and tonic. We made a great spring sipper, the Strawberry Limeade Gin and Tonic which is one of our favorite drinks! A few weeks ago we had used some tangerines to make a great tequila cocktail! (It’s exclusive on Instagram, which if you aren’t following us on Instagram you are missing out on a lot!) Then we fell in love with the fresh sweet citrus that is unique to the tangerine. 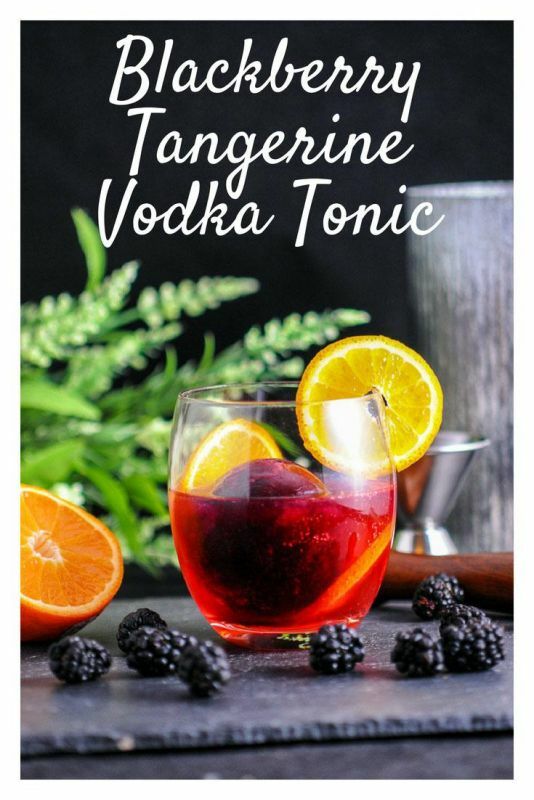 Different than an orange, and sweeter than a lemon or lime, the tangerine works really well to add a brightness to our Blackberry and Tangerine Vodka Tonic. One great combination of flavors is fresh berry and citrus. Of course we had a nice set of fresh spring blackberries in our fridge. We thought would be perfect to add some nice flavor to a vodka tonic, too. 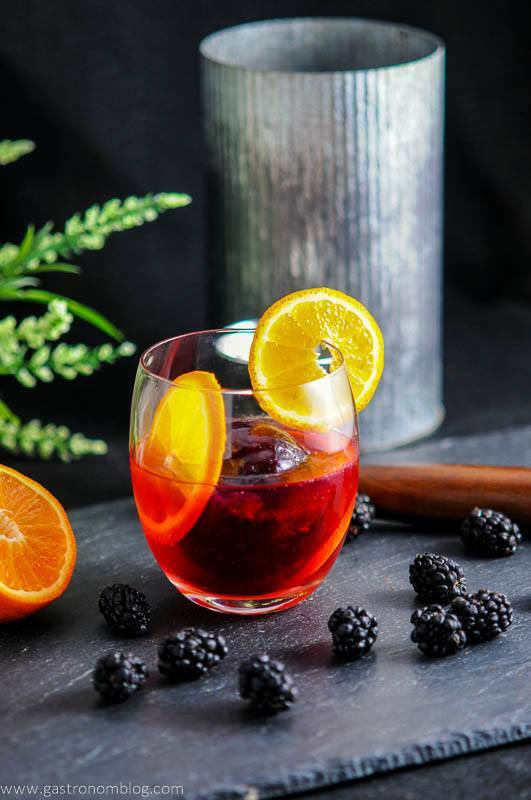 We initially thought we could just throw some blackberries in with the tangerine and vodka tonic, but we felt the blackberry flavor wasn’t bold enough. Then we wanted to find a way to get more blackberry flavor into the drink. We definitely didn’t want to muddle the blackberries because that tends to release the seeds of the blackberry which makes the drink feel less elegant. Jay and I recently had a night out a a local cocktail bar where they served a drink that used an infused ice cube to add flavor to the drink. This concept was really cool because as the ice cube melted, the flavor and appearance changed as more flavor was added into the cocktail. We decided to try this technique by making a blackberry syrup infused ice ball! 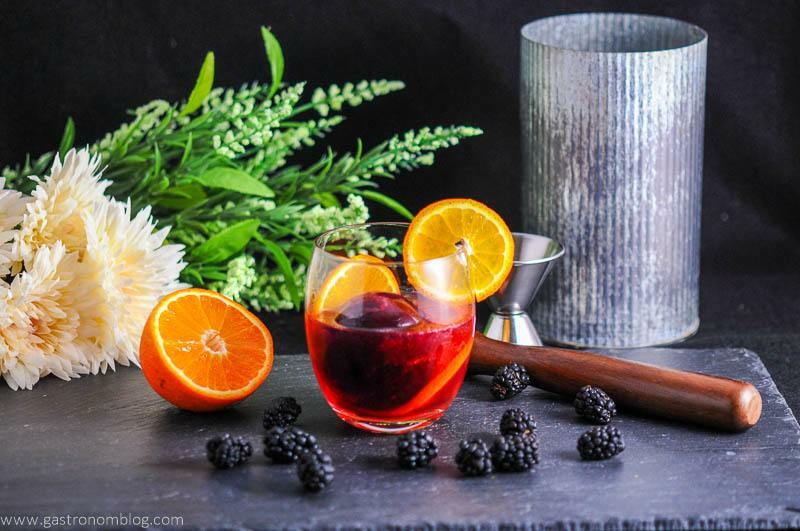 What Ingredients are Needed for the Blackberry Tangerine Vodka Tonic? The pairing of blackberry and tangerine is a nice combination. The sweet tangerine helping enhance the berry flavor while also bringing a great citrus aroma. 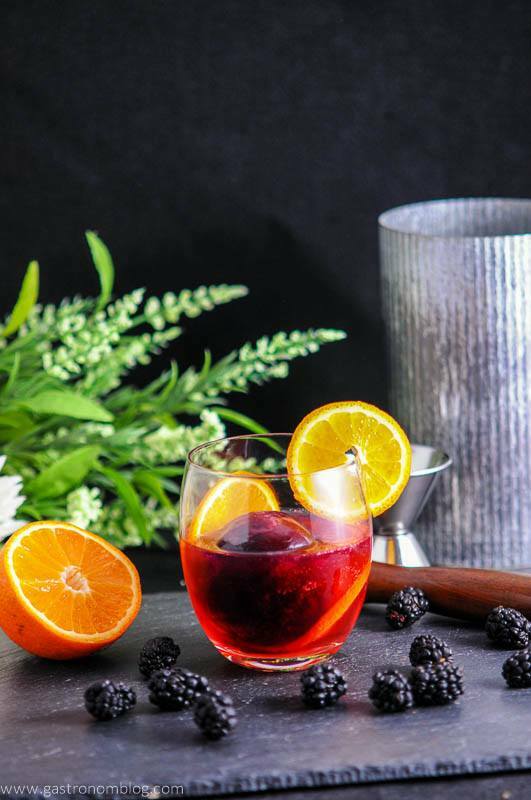 Clean, cool and crisp, plus really cool looking, the Blackberry and Tangerine Vodka Tonic is going to go in our spring and summer drink rotation! 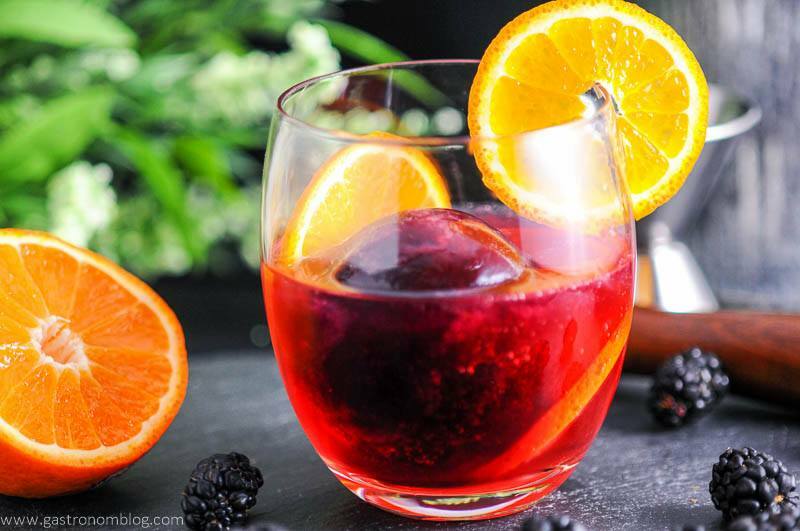 A fruity and berry version of the classic vodka tonic. A fun fruit filled ice ball! Add vodka, tangerine slices and ice ball to a glass. Place sugar, blackberries and water into a small pan. Bring to a boil and allow the berries to "pop" and release the juice. Add syrup into ice cube trays or molds and top with water. 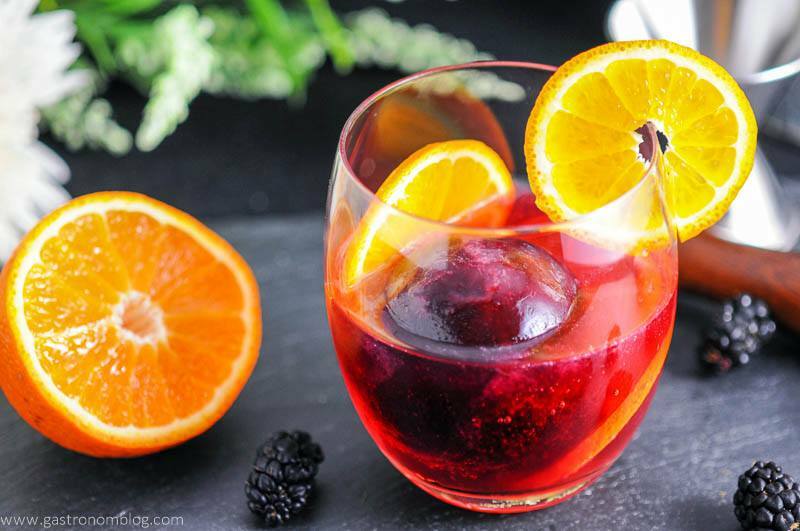 PIN THIS BLACKBERRY AND TANGERINE VODKA TONIC RECIPE FOR LATER! What a pretty drink! I love the ice ball idea. I have a few of those little molds and love them because they don’t melt as quickly as the cubes. Thank you! 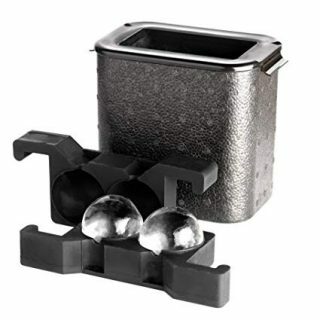 We loved these ice molds! You are right that they don’t melt as fast, and then don’t water down the drink! Cheers! You come up with the most amazing concoctions! Adding this to our weekend cocktail list! I love anything with blackberry, so you bet I’m going to make this ASAP! This is so attractive ad unique. I never thought of including blackberries in y drinks. Thanks so much! We love blackberries in cocktails! Yum!! What an amazing concoction! It’s so pretty too!! I love that you made the ice ball with blackberry syrup! Infinite flavor! Thanks so much! It added so much flavor throughout the drink! Thanks! Hope you can try it soon! This cocktail looks dangerously delicious! Those flavors are right up my alley, and I will be making a batch of these this weekend! Thanks so much! Hope you got to try it out! I would, LOL! Enjoy, and cheers! Ok this sounds like the most delicious drink! I need to try it this weekend!! Yum! This looks and sounds yummy! You have blown my mind with the idea of turning syrups into ice cubes. This drink looks fantastic and I can’t wait to try it!! Thanks so much, we had fun with this one! Cheers! I’m sure you’ve heard it before but your photos of drinks are absolutely stunning! I keep checking your pinterest feed for inspiration! This post is not an exception! Thanks so much, you are so sweet! Thanks, and cheers! My kind of drink!!! A must try!! Thanks so much! We love gin and well, but vodka at times can be such a base spirit to build off of, and this has such big flavors that it worked really well! Hope you try it out! Cheers! Oh, wow! Your drinks always look amazing! I am totally loving this and can’t wait to make it! Thanks so much! Hope you try it out! Thanks so much! And I am totally digging the death star ice balls, LOL! 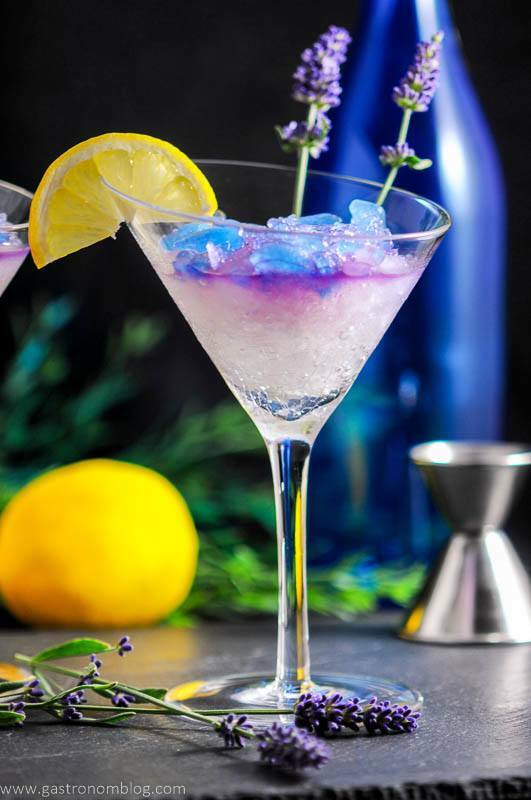 I usually don’t drink gin, but I think this drink could totally make me a believer- it sounds so delicious and looks really pretty too! Perfect for summer! 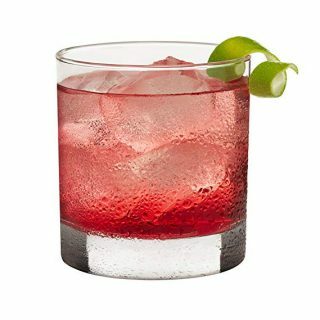 Love the refreshing flavors in this cocktail am completely crushing on that Blackberry syrup infused ice cube! What a fun idea to serve to guests this summer. A delicious cocktail, and a great conversation starter! 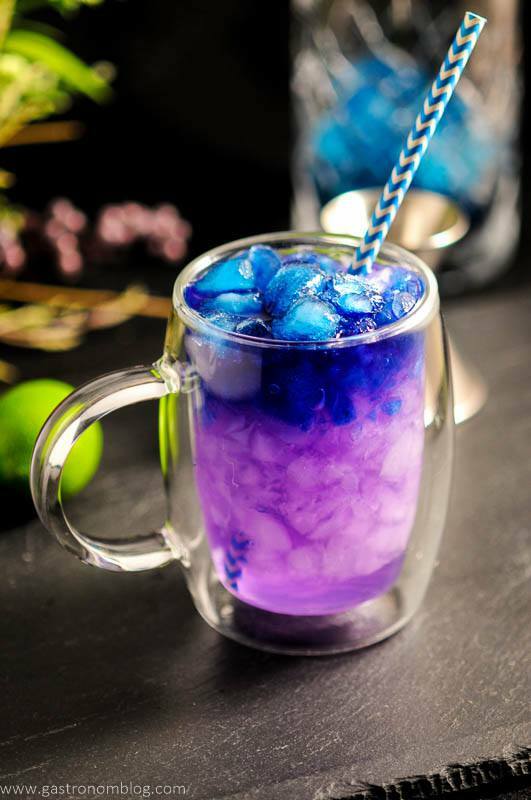 This drink looks fabulous! I can’t wait to try making it. I just have one question. For the blackberry syrup, you’ve listed the ingredients as 1Tbsp sugar, blackberries, and then 1/3 cup sugar. Am I wrong to assume you meant 1/3 cup water? Or is it really sugar? Thanks for the clarification!! Sophia, Yes, it’s water. We apparently just really wanted sugar, haha! Thanks for noticing that typo. Hope you try it out!